Win probability graphs for the Australian Open are now available. Unlike my win probability models for the NBA and soccer, which required regression analyses and lots of smoothing, the development of the tennis model was more straightforward, if a bit tedious. Once you specify the probability of winning a point on serve, the rest is no worse than a college-level probability exercise. Despite leading two sets to one in the fourth set, Seppi's win probability rarely crossed the 50 percent threshold; that is, until the final three points of the match. Seppi trailed Federer 4-5 in the fourth set tiebreaker. His win probability was 34 percent. Seppi won the next point on serve, and his chances increase to 52 percent (+18%). 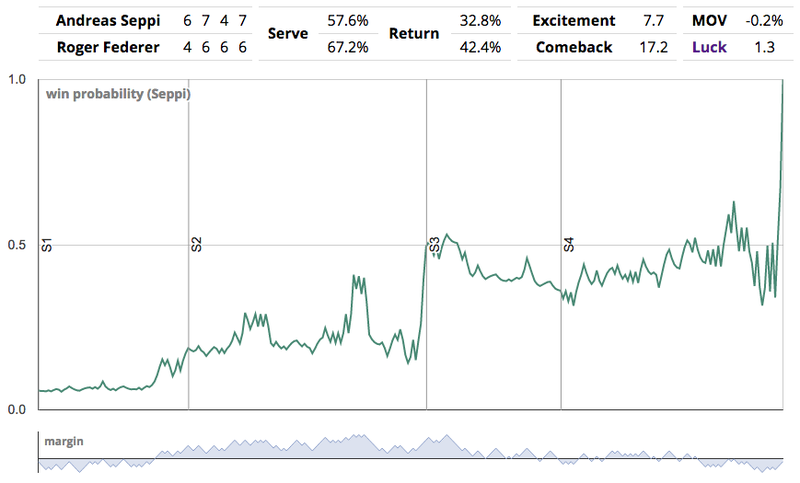 Federer served next, Seppi wins the point: win probability at 67 percent (+16%). Seppi now has match point and the serve. He wins the point and the match, his win probability increasing by 33% on a single point. Check back daily for the latest matches.